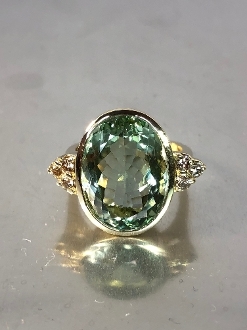 This green amethyst ring is set in solid 14 karat yellow gold and champagne diammonds. Total green amethyst weight is 18.74ct. and measures approximately 17x22mm. Total champagne diamond weight is 0.60ct. Since this ring is made to order, kindly allow 2-3 weeks for production.